MARC STEINER: Welcome to The Real News Network. I’m Marc Steiner. Good to have you all with us. The new class of political battle inside the Democratic Party seems to be between the Democratic establishment and the rise of new people from the Democratic Socialist association and others; candidates that are defining what’s happening in politics in America, redefining what’s happening in America. And it’s happening in the 15th California Assembly District. It’s a district that comprises working-class cities like Richmond, and academic left-wing enclaves like Berkeley, and parts of Oakland, California. One of the candidates running- they’re both, actually, Democrats in this final election. One of them is an Obama acolyte whose name is Buffy Wicks. The other candidate in the general election is Richmond City Councilwoman Jovanka Beckles. Jovanka Beckles and the other candidate are similar on some issues, but really different. Jovanka’s running on single-payer, full daycare, free college, as a member of the Democratic Socialists of America, which sets her apart. In our continued exploration of America’s future with progressive candidates from around this country, we talked today with Richmond Councilperson Jovanka Beckles, who’s running for the Assembly seat in the 15th District. And Jovanka, welcome back, good to have you with us here on The Real News. JOVANKA BECKLES: Thank you so very much. Great to be here. MARC STEINER: Good to have you with us. So what I want to do, we’re going to start by playing this short clip of your campaign ads to give people a flavor, and then jump into our conversation. JOVANKA BECKLES: All right. Very well. VIDEO: My name is Jovanka Beckles. I’m a mental health professional, a union member, and an immigrant. For the past eight years on the Richmond City Council, I’ve been part of a movement and fight corporate [money]. We rejected corporate campaign donations and achieved victories for working people. We banned the box, won rent control, and a $15 minimum wage. When working people come together, we can take back control of our lives, and a greater share of the wealth that we ourselves create. Because together we can build a California that puts people over profit. MARC STEINER: So for our viewers across the country and the globe- let me explain very quickly and see if I have this right, Jovanka- in California when you run for political office, the top two vote getters, to make 50 percent, run against each other. Many places have two Democrats running against one another for the general election, which is what’s happening in your district this moment. Is that correct? JOVANKA BECKLES: That is absolutely correct. In fact, in the primary there was one Republican in a race full of 12 people. MARC STEINER: It says something about your district. JOVANKA BECKLES: It says a lot about our district. Exactly. It’s the most progressive district, the most diverse district in the state. MARC STEINER: So I really want to explore, because I think this, as I said at the top of the program here, this is kind of an example of this new classic battle across the country in the Democratic Party. But talk a bit about that as you see it. Because Buffy Wicks is an Obama acolyte, as I said. She worked for his administration. She helped his campaign in California when he fought against Bernie Sanders’ campaign in California. But she also is very liberal and progressive on a number of issues, and that’s what mean by this new battle. Define what you see as the difference between that point of view and point of view that you’re running on. JOVANKA BECKLES: Yeah, it’s exactly right. And I you know, I know folks have have expressed that oh, you know, we’re we’re both very liberal, very progressive. But I haven’t really seen that in terms of the policies that we both find to be the most important. So in other words, we differ in so many different ways. We both agree, of course, yes, something needs to happen with regard to wealth inequality. We both agree that there’s an affordable housing shortage, absolutely. But we differ in the way that we- in the solutions that we have. We differ in the solutions to address the housing crisis. I believe that we need to build hundreds of thousands of new affordable housing, public housing. She believes that we will get ourselves out of this mess by building market rate housing, and I don’t. I disagree. And so that’s why we differ when it comes to just- one of the other solutions being the support for Prop 10, which is the repeal of Costa-Hawkins at the state level. I support it. The opposition does not. That’s one way we differ. We also differ in other ways. I believe that when you have an attack on the public school system the way that we’re seeing it, unprecedented numbers of resources being drained from our public institutions, our public schools, we need to have a moratorium on charter schools. And she does not agree that that’s the way that we address resources being drained from our public schools. I also believe that we need to get dark money out of our elections, out of our politics, and our government. The majority of money comes from, that were donated to me, comes from right within the district. The majority of money that she’s received comes- a lot of it is coming from Washington D.C. Unfortunately, a lot of the billionaires that are donating to her campaign are the same billionaires who not only donate to Republicans, but are invested in privatizing our schools, are invested in private prisons, and are committed to destroying unions, and destroying- and not supporting the implementation of a single-payer healthcare for all system. MARC STEINER: So if I’m clear, you are a union member. You’re in the Teamsters, correct? JOVANKA BECKLES: Correct. Local 856. Absolutely. MARC STEINER: But you’re a mental health worker by trade? JOVANKA BECKLES: There we go. Teamsters Local 856. And yes, I’m a mental health professional by training. I’ve been in the mental health field for 30 years right here in the Bay Area. That’s the other way that we differ. I’ve lived consistently in the Bay Area for 30 years, and have worked here consistently for 30 years. I moved to the Bay Area in 1989, and I have never moved away, but I’ve been devoted to creating the change that I like to see in my community for the last 30 years here. MARC STEINER: So let’s take a couple of these things that you’re talking about. I want to take a broader issue here first, before I talk about some of the specifics you’re kind of talking about in your district. What does it mean for you as a union member to be a socialist, a declared democratic socialist, running for a State Assembly seat? I mean, clearly the socialists won’t have a majority in the Assembly. They most likely will not for the foreseeable future. But what does that mean for you, to be a socialist running? JOVANKA BECKLES: It means that I believe that there is more than enough to share. I believe that in the fifth-largest economy in the world, within the largest economy in the world, there is enough resources for us to share. We as working people, we created this wealth that we are seeing, and yet we’re not benefiting from any from it. We’re not being, it’s not being shared with us. And so we as working-class people absolutely have to have a seat at the table. We have to have a seat in positions of power to be able to change this direction that we’re seeing, where we’re seeing the gap between those who have and those who do not have widen every day, by the day. And so it’s so important that as working people we know, we see, we experience firsthand the challenge that it is to make ends meet. The challenge that it is to pay for for healthcare, to pay for food, to pay for rent, or a mortgage, and still be able to have some, you know, some spending money, right? Some disposable income. And so when we have more working people, I believe, in office, we’ll start to see the wealth shared a little bit better and more equitably. So one of the things we see in this race also, I believe George Miller the congressman came out in favor of Ms. Wicks, and Barbara Lee came out to support you. Am I right about that? JOVANKA BECKLES: Yes, you are. So excited. The congresswoman is someone that I’ve admired for years, particularly when she was the lone ‘no’ vote to start us in this endless war that we are still experiencing today. So she’s always been someone that I’ve admired because of her courage and her willingness to stand up for the people and be a voice for the people. So that’s really exciting. This happened yesterday. The endorsements from other unions are also coming in. So we’re really seeing this campaign gain so much momentum on a daily basis. MARC STEINER: So let me talk about the issues here. And when you, when you talk about the housing issues, and talking about Prop 10 and what that means, and what the battle is over Prop 10- and I believe that is your opponent has not said she’s for or against it, she said let the voters decide, but you very clearly have come out on this on this value proposition. Talk a bit about that. JOVANKA BECKLES: Right. What Prop 10 does is right now, cities like Richmond- I’m really proud to have been in this movement to bring the first rent control policy to a city, the first one in 30 years. So Richmond, we passed a rent control on the ballot. However, our hands are tied. And Berkeley has rent control, and Oakland does, too. MARC STEINER: And hands are tied why? Why are your hands tied? JOVANKA BECKLES: Hands are tied because of Costa-Hawkins. That’s the state law that exempts properties built after 1995 from rent control policies. And what Prop 10 does by reforming Costa-Hawkins, by repealing it, rather- my, the opposition wants to reform it. But we, the majority of people understand that we have to repeal that that law so that states, so that cities, can have more power, more control in creating the kinds of policies that best fit their residents. And so right now we’re seeing, for example, in Oakland lots of new development; for-profit luxury units being built right now. And those units are not going to be under rent control, under the rent control policies, because they’re being built, you know, after 1995. So by reforming that it gives cities more options for those, for better policies that best fit their residents. And so my opponent believes that we don’t need to appeal that, we need to reform it. And it really is, you know, her idea of housing development, her plan, really is- there’s no other way to say it, but it really is a public giveaway of land for the for-profit developers. And I believe that we really should be using our public land and money to build the permanent, affordable, not-for-profit housing that that we need. MARC STEINER: So let’s talk about money for a moment. One of the things, the conversations I’ve had with people in this state, where we broadcast from in Maryland, and across the country, about certain policies is about money. We live in a capitalist world, which is how our economy is managed and run. When people talk about having a single-payer system in the state of California, when you talk about daycare for working families that is paid for in California, when you talk about free college tuition, which used to be in California, as it was in New York once, and no longer is. First question people will ask, will ask Jovanka Beckles: how do you pay for that? In this system, how do we pay for those things for our people? JOVANKA BECKLES: Absolutely. So we’re really seeing now in 2018, we’re seeing how capitalism really is not working for the majority of us. It’s only working for a very, very small percentage of people. So you pay for these things by taxing the wealthy, by taxing the rich, by insisting that they pay their fair share of taxes just like the rest of us. And you do that by reforming Prop 13. And in California, Prop 13 really is a way for big corporations to have a loophole, and not pay their fair share of taxes. So when we reform that that proposition- and it will be on the ballot- we will then be able to have the resources that we need. Since Prop 13 was initiated in, I think it was 1979, we have lost about $367 billion in revenue. Now imagine what we could have been doing with all that money lost. And so when we reform prop Prop 13, we’ll then have the billions of dollars that we need. But it isn’t just a matter of of taxing the rich through proper reform of Prop 13, it’s also taxing speculators. It’s also taxing vacant properties that they buy and they keep open, they keep empty. And so when we tax these kinds of speculators and vacant properties, we can build the, as I talk about in my platfor, the hundreds of thousands of of housing for all, through taxing the rich. We can also- that will bring millions and billions of dollars to the state for us to build the affordable housing that we need, and that people have a right to. People have a right to shelter. We’re seeing so many people who are working 40 hours a week living out of their cars, and something is terribly wrong when hardworking people can’t afford to pay rent in the state of California in the Bay Area. MARC STEINER: So Jovanka, one of the things I think that a lot of us really wonder about, and many of our viewers who wonder about people around this country are wrestling with, is for people running as democratic socialists in this country, we live in a land right now that is hugely divided in terms of political viewpoints. And It’s gotten to a point where we are as divided now as it was when I was younger civil rights worker down South. It’s that intense. I can feel the same intensity at the moment. I’m just curious, from your perspective, what the political battle means that we’re facing now when we’re so divided as a people. And so much is built around race, it’s also built around, kind of, political viewpoints and more. And what that means, you think, for our future, your future as Californians and our future as Americans, and where that takes us. JOVANKA BECKLES: Yes. You know, we’re all in the same boat. The 99 percent, we’re all in the same boat. Because what we’re seeing now is a movement. Is a movement that really is stating a loud message. We cannot continue in this direction. The for-profit system that puts profit above our health, that puts profit above our education, that puts profit above our planet, is not working. It’s not a sustainable model. We need- people are fighting. We’re coming together, we’re realizing that we have to put aside our differences of race and age and even political affiliation, and come together as one united people to fight against the injustice that we’re seeing, to fight against the greed. What we’re seeing right now, as people are understanding that we have to elect more candidates, more public officials who are going to always put the needs of the planet and working people and our children and our health above the profit of of our billionaire class and corporations. What we’re seeing is a movement where people are understanding that we are getting poor while they’re getting richer, and it’s not a model that’s sustainable. Because when we don’t have the kinds of regulation that we need, our planet is literally burning. Our planet- we’re seeing the weather is wreaking havoc right now in Florida and throughout the world. And that’s a scientific truth that if we continue to go in this direction we’re not going to have a planet to live on. And so no amount of profit- we have two corporations right now, I believe it’s Amazon and Apple, that have now reached the trillion dollar profit line. That is not a model that is sustainable, because we the workers created that wealth, and we are realizing that we deserve, we’re entitled to share that wealth that we ourselves have created. And so we have to build a world, a California, a United States that puts the needs of the people above the profit of corporations. And that’s the, that’s the model that we’re seeing; a movement that’s gaining momentum more and more every day. And so I’m really excited about what we’re seeing, that people are now awake, and are passionate and driven to change the system, this very corrupt, unjust system that we are all experiencing. MARC STEINER: So very quickly here as we conclude, Jovanka- I mean, I understand also that the campaign, which was really kind of aboveboard for a long time, and the two of you, with different positions, were acting fairly honorably, at least in the debates I’ve seen, the conversations I’ve seen taking place. But things have gotten ugly. I understand that some red-baiting has taken place and people are literally attacking your signs, and attacking you as a person. Not physically, but your character. JOVANKA BECKLES: Yes, attacking my character. Red-baiting a black woman living in the United States of America. Our signs are being defaced. They’re being tagged with things. One sign I saw someone had “Communist voters unite.” Don’t even understand. That’s obviously people who don’t understand the difference between communism and socialism. Socialism just says that there is enough wealth to share. That’s all. That’s what that means. And it’s unfortunate that any working-class person would not subscribe to a model that benefits all of us. They’re they’re attacking my character. There’s whisper campaigns. I had a gentleman, a black gentleman the other day approached me saying he heard that I hate black man. And I know that it’s a whisper campaign based on the fact that I’m an out lesbian on the Richmond City Council. But to take it to that level, that I hate black men, is really disheartening. But it’s not the first time that this has happened. In 2008 when I ran the first time, that was the whisper campaign; Jovanka doesn’t think she’s black, Jovanka doesn’t like black people because, you know, she’s a Latina. And then there, then the other whisper campaign was, you know, Jovanka is a Green Party member. And I’ve been a Democrat for 37 years at this point. But it’s just the kind of things that people use to divide us. Our office in Richmond has been vandalized twice. And so we’re seeing that our message that resonates with the majority of people to actually build a California that works for all of us, it resonates with the people to have a California that’s just and equitable. Resonates with the majority. But we’re seeing that there are those that are feeling threatened. And unfortunately, you know, the very people that I’m sure are doing these things are working-class people not understanding that everything that I do, everything that this movement is about, is for them. And so that’s really unfortunate. But we move on, we persevere, we stand up, we fight back, and we’re going to win this election in November. 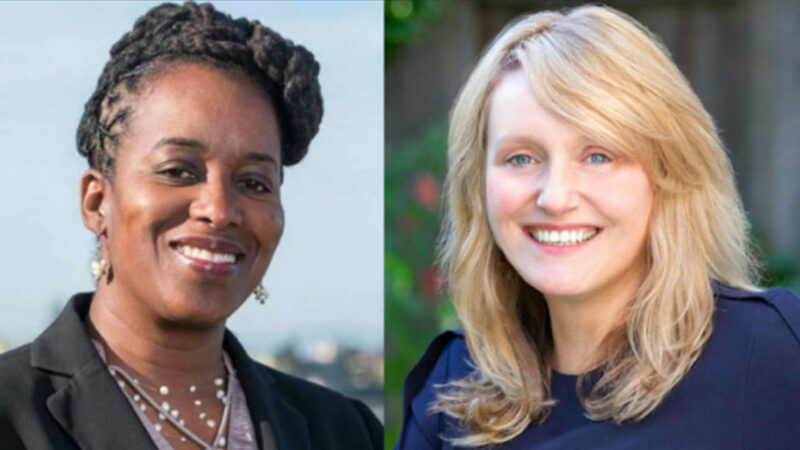 MARC STEINER: We’ve been talking to Richmond City Councilperson Jovanka Beckles, who is running for the 15th Assembly District in California. And Jovanka, thank you so much for joining us here on The Real News. It’s been a pleasure to talk with you. JOVANKA BECKLES: Thank you. Pleasure is all mine. Thank you so much. MARC STEINER: Take care. And I’m Marc Steiner for The Real News Network. Good to have you with us. Take care.